Rhubarb, like all angiosperms have an alternation of generations life cycle. This means that the plant, in our case rhubarb, has both haploid (1N) and diploid (2N) multicellular stages. Haploid refers to having one set of chromosomes and diploid refers to having two sets of chromosomes. In rhubarb, the diploid sporophyte phase is the dominant stage while the haploid stage is smaller and dependent upon the sporophyte phase. Rhubarb is a self-pollinating plant and does not require an external source, such as bees or insects, for reproduction. Another important factor to consider in rhubarb is that it is a perennial, so after the first seed is planted, the sporophyte phase will continue to provide new growth in the spring. 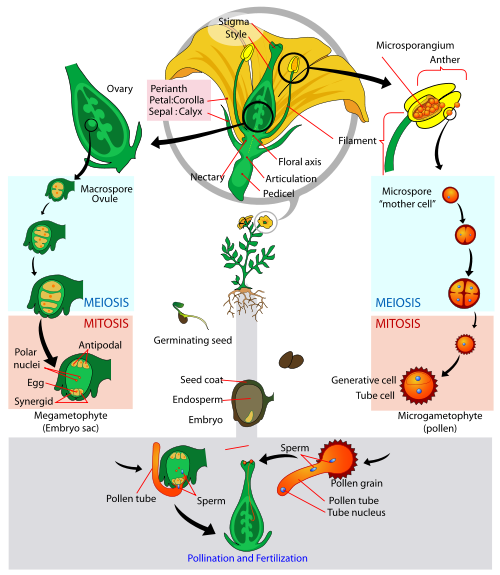 The image to the left shows an angiosperm life cycle. During this process, the diploid sporophyte will go through meiosis to produce haploid spores. - The male reproductive parts contain diploid microsporocytes that produce haploid microspores through meiosis. - Inside the ovule of the female reproductive parts are diploid megasporocytes that produce haploid megaspores through meiosis. 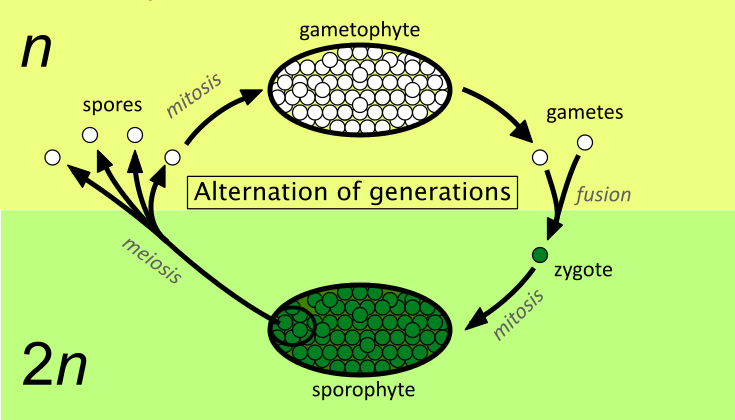 The haploid spores undergo mitosis to produce haploid gametophytes. - The male microspores produce haploid microgametophytes. - The female megaspores produce haploid megagametophytes. The sperm from the microgametophytes and the egg from the megagametophytes fuse during fertilization to produce the diploid zygote that will undergo mitosis to form the dominant diploid sporophyte. This process will repeat over and over again. In the case of rhubarb, as I mentioned above, after the seed is planted into the ground once it will continue to come up year after year and the diploid sporophyte phase is what allows for this growth each year. Two other organisms that have this same alternation of generations life cycle are Poison Ivy, Toxicodendron radicans, and the English Ivy, Hedera helix. Go to Home. Go to Multiple Organisms. Go to UW-La Crosse.